Daytona, Fl – Daytona International Speedway was full of excitement and emotion for the Earnhardt driver competing in this years Coke Zero Sugar 400. 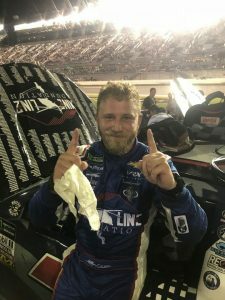 Jeffrey Earnhardt was piloting the number 7 Nine Line Apparel – Xtreme Concepts Chevrolet Camaro owned by Premium Mororsports and with a small army of veteran VIP supporters cheering him on, he was not about to let them down. Earnhardt started 34th in what would be a challenging race. Throughout the wreck filled race Jeffrey made some incredible moves to avoid major damage and put himself in a position to be part of the final restart. “We had a penalty that put us a lap down but we kept digging and when that final caution happened we got back onto the lead lap and were running top ten.” Earnhardt pushed hard and when the checkered flag waived he brought home his best MENCS 11th place finish. Earnhardt is making plans for his next race and will be announcing news shortly.